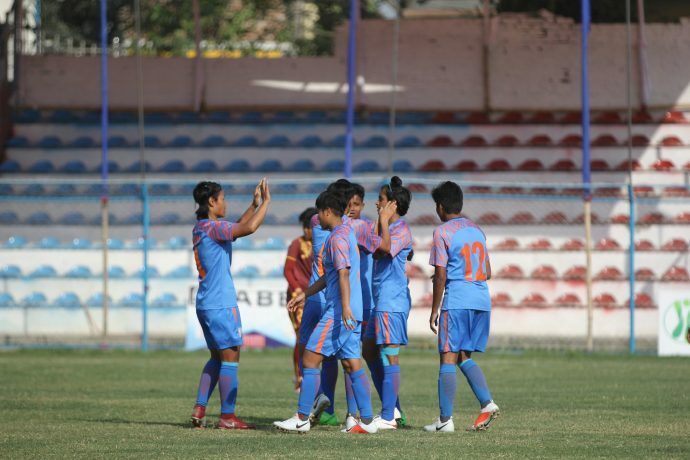 After three wins on the trot in the SAFF Women’s Championships 2019, India will face off against hosts Nepal in the final on Friday (March 22, 2019) at the Sahid Rangashala Stadium in Biratnagar and given the recent results between the two teams, the encounter promises to be a thrilling one. After a 1-1 draw in November 2018, the previous meeting between the two sides saw Nepal register a 2-1 victory against India at the Hero Gold Cup in Bhubaneswar last month. This time around, coach Maymol Rocky and her wards are eager to clinch their fifth SAFF title in a row and set the record straight. “But now, it’s time to play our game. We have recovered well from the semifinal and are completely focused on the final game. The entire team is fired up and we all want to correct our previous result. The players are all ready and raring to go. We will play our brand of attacking football and go all out,” coach Maymol stated. Both teams go into the final on the back of similar sets of results – with India scoring 15 goals in their three matches so far and Nepal scoring 10 – and both teams not conceding even a single goal so far. A full house is expected at the Sahid Rangashala Stadium on Friday to support the home team, which could make things tricky for the Indian team. However, the head coach is confident that a possibly hostile atmosphere will only inspire her wards to raise their game. “Nepal, as hosts, will certainly enjoy the support of their fans but I am certain that it will only lift my team. We have prepared the girls physically and mentally, and we will give it our all on the pitch in the final,” she exclaimed. The final between India and Nepal on Friday will kick off at 2.45 PM IST. It can be streamed live on mycujoo.tv.